One Mom’s Journey to Motherhood: Infertility, Childbirth Complications, and Postpartum Depression, Oh My! 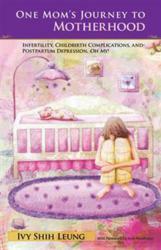 New book by Ivy Shih Leung provides an in-depth look at one mom’s life before, during, and after postpartum depression. One Mom’s Journey to Motherhood: Infertility, Childbirth Complications, and Postpartum Depression, Oh My! (published by Abbott Press) by Ivy Shih Leung is a new book that bravely attempts to bust motherhood myths and the stigma that exists because of those myths—and the impact such myths and stigma have when it comes to societal perception of mental health issues during pregnancy, childbirth and postpartum. An ordinary woman emerging from a life-changing experience, Leung has decided to make a difference in the lives of others by telling her very honest story about how postpartum depression (PPD) prevented her from fully appreciating her first few months as a mother – a time that society only characterizes as a happy one. Ivy Shih Leung wrote her book based on what she was so desperate to find when she was suffering from PPD herself—comfort, hope of recovery, and helpful tips and facts to help validate that what a PPD mother is experiencing is a real illness with physical symptoms and needs treatment, just as any other illness like diabetes has physical symptoms and needs treatment. One Mom’s Journey to Motherhood provides a window through which readers can get a glimpse of Leung’s life before, during and after PPD, and how her life before PPD played a role, since both genetic and environmental factors can trigger it. The book touches upon the biopsychosocial roots of PPD without sounding like a textbook laden with dry, scientific statistics and biological research. It emphasizes the importance of self care. “The health of the family unit is dependent on the health of the mother, so it is of utmost importance that she goes into motherhood knowing what to expect in terms of pregnancy, childbirth, and the postpartum period.” This includes how to deal with certain challenges in infant care, keeping stressors to a minimum, and getting plenty of support. “PPD is the number one complication of childbirth, with 1 out of 8 mothers suffering from it, and yet it is still woefully misunderstood, under-diagnosed and untreated,” Leung says. She indicates how much more work needs to be done, but at the same time points out that America would do well to continue to keep pace with the progress that has taken place in the past decade in terms of celebrities speaking up and legislative developments. Ivy Shih Leung is a postpartum depression (PPD) survivor and advocate, the author of Ivy’s PPD Blog, and a member of Postpartum Support International. A graduate of Mount Holyoke College with a Bachelor of Arts degree in biology, Leung lives with her husband and daughter in New Jersey.